Whiteboard Energy is celebrating the next iteration of its innovative online resource centre with a free sample of its renowned content. Whiteboard is expanding the methods by which people can access the resource centre, which complements a similar expansion of its flagship course. When Whiteboard made its move online we researched the best available methods for demonstrating the interconnectedness of the electricity industry in an accessible way. This research concluded in the decision to build our own web software in collaboration with The Common Room. 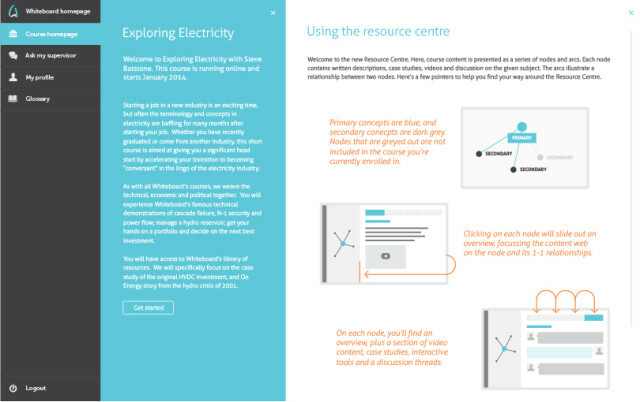 In the resource centre users can navigate through the subject matter using the interactive map, zoom in on a topic of interest, read the highlights or delve into the videos, primers and case studies. Anyone interested can now have a free look, getting a full sample of some of the subject nodes to get a great feel for the Whiteboard online experience. And the next generation of the resource centre is the perfect complement to Whiteboard’s next course. Dates for the History and Politics course, around the end of September, will soon be announced. Participants in the course will get online resource centre access, and a one day in-class session in Whiteboard’s interactive, immersive style. The political dimension is made highly poignant by stories from our history. Where it is all too common to find an anxious age of agitated amnesiacs (thanks Neil Postman), here we show good context makes for good decision making. And the coup de grace of this module is a group session with the Honourable Peter Hodgson – a better perspective on politics and energy you will not get. Watch for it soon.